How does 2iNNOVATE identify the right ideas? How do ideas lead to success? The formula is quite simple: SOURCE. SELECT. SUCCEED. The first important step is 2iNNOVATE by choosing the right sourcing partner. 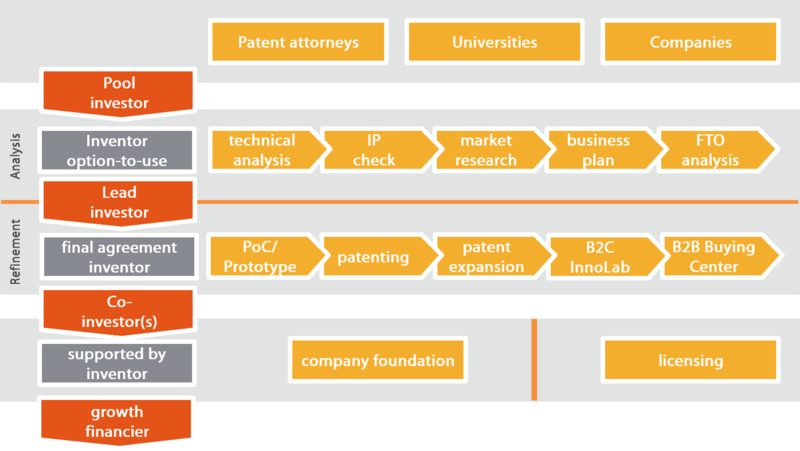 Exclusive agreements are made with universities, companies and patent attorneys. Other sources of innovation are the companies we reach via our partner network. In phase 1, investors participate in the financing of the first stage of our selection process. You invest in a broadly diversified basket of ideas at an early stage and therefore secure a relatively large participation in the future economic development of the project. With the inventor’s consent to proceed, the next step of analysis starts. Together with our partner companies, we examine the competitive situation, the sales potential, the suitability and comprehensiveness of the intellectual protection of the idea and its technical feasibility. The result is an initial business plan. Additional capital is then needed to refine the idea. Lead investors can secure a significant share of the further development of the project. At this stage financiers invest into a certain number of selected projects. Based on the willingness of the inventor to exploit his idea, the finishing of the project begins. In addition to ensuring the business permit and a comprehensive patenting, a Prototype is created for marketing purposes. After a successful market test, the final proof-of-concept and feasibility is completed. If the result of the selection and refinement process is that a company foundation is the best way to exploit the potential of an idea, this way has to be financed. Co-investors who enter here secure the last chance to participate in the innovation and so to help each project in becoming a success. Besides a dedicated corporate foundation to implement the idea 2iNNOVATE provides a second way: The licensing of the patent to companies that can generate the greatest possible economic benefit from it. By objectively selecting the most promising implementation path we secure the best approach for success. With the successful launch of a company's products are developed, successfully opened up the management team on board and first market potential. 2iNNOVATE supports companies in finding the necessary resources to develop new products and markets: The basis for further growth. Are you curious? Do you want to share your idea with us or contribute as a partner company to the success of our projects? Do you want to contribute financially to the realization of projects? Contact us! 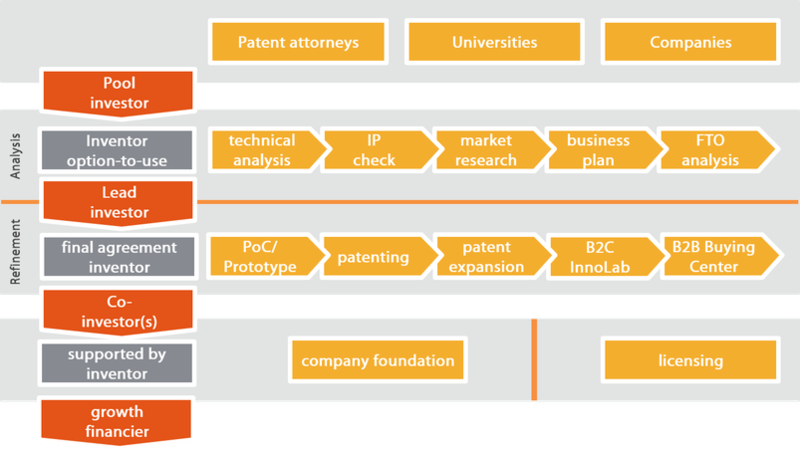 Here you will find again the entire 2iNNOVATE investment process at a glance.